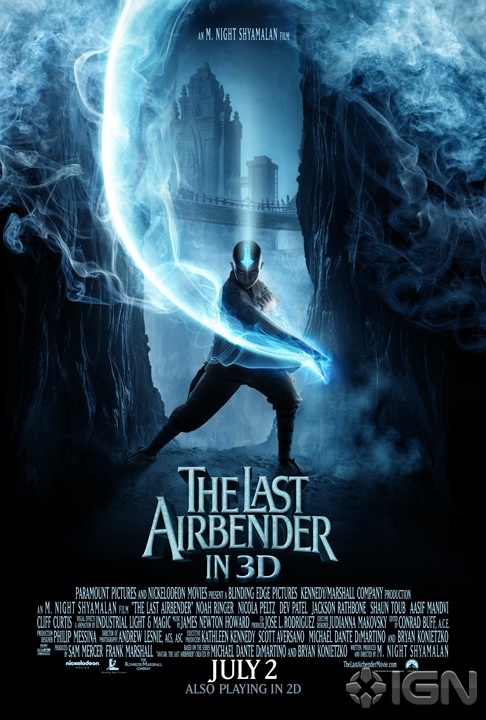 Thanks to our friends at Paramount, we’re excited to bring you an exclusive look at the poster German Airbender fans will be seeing at their local theaters this Summer! Pretty neat, eh? 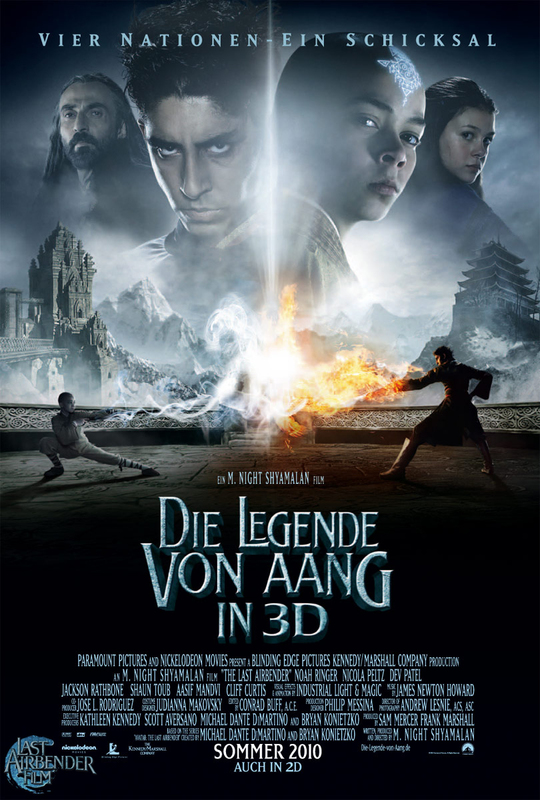 The Legend of Aang in 3D awakens in Germany on August 19! 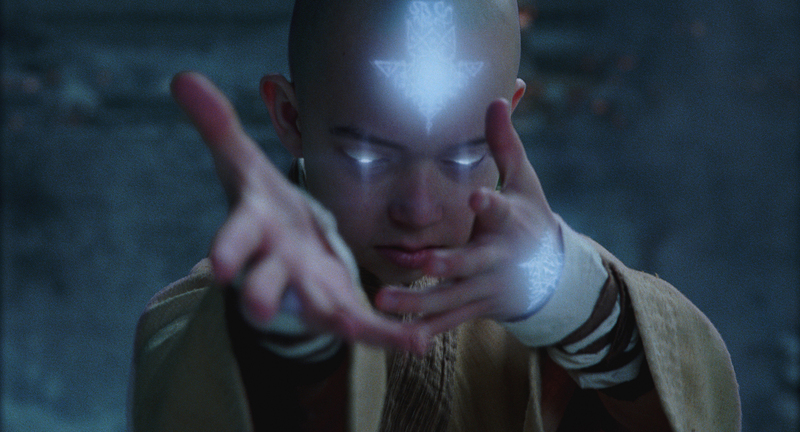 Three previously seen publicity photos from The Last Airbender have been passed along to us by Paramount, now in high definition. Start spreadin’ the news. I’m leaving today! Upon waking the morning of my departure, it was hard not to conjure up visions of little green monsters singing the classic Liza Minnelli tune as they looked forward to a night of painting the Big Apple red. To say I was excited would have been a gross understatement. 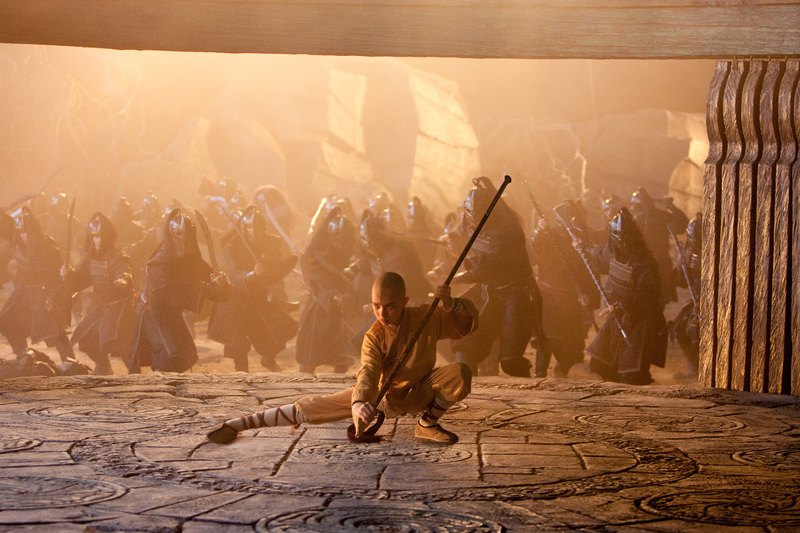 What I had initiated with my friends at Paramount back in July ’09 was finally coming to fruition: an interview with The Last Airbender director M. Night Shyamalan. I had spent the better part of a week taking questions from my readers and fellow Avatar fans, or ‘Avatards.’ I am not exactly clear which fandom owns that name anymore, as it would seem fans of James Cameron’s Money Printer have appropriated the title for themselves much the same way Cameron did the title of the film. I digress. Procrastinator that I am, I realized I had very little time to make my final preparations for the trip. So the next several hours were spent picking up my clothes from the cleaners, deciding on a tie to wear, buying a new tooth brush, returning some videotapes, learning I would not be required to wear a tie, scribbling down twenty of your best questions, feeding the cat, packing my overnight bag, and feeling down about not being able to wear the awesome tie I bought. Jordan Hoffman of UGO.com scored an exclusive phone interview with M. Night Shyamalan, in which we learn the pronunciation of some character’s names has been changed, firebenders do in fact require an outside source for their fire (as we previously reported), and more! 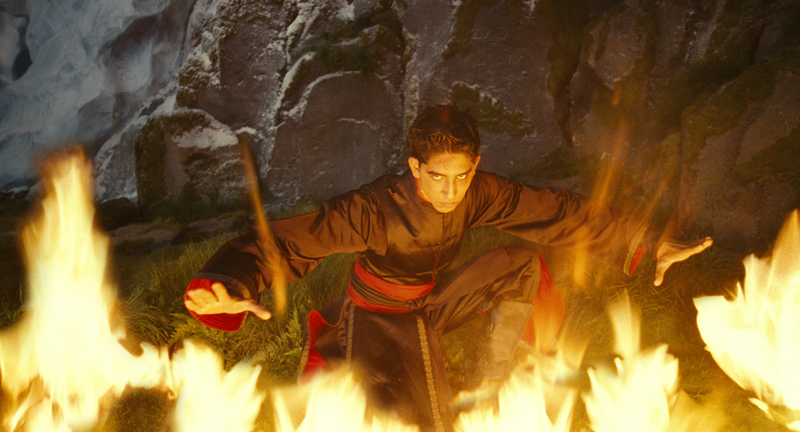 M. Night Shyamalan: Let’s talk about Firebending. When I first saw the show, I saw that everyone else needed their element around them. You need water to bend water, earth beneath your feet to bend earth and air is all around us. So, the idea of self-manifesting fire was the first thing that popped into my head, in terms of wanting to understand this world. Now, manifesting fire through chi, I thought, was fascinating. So – in our movie – the majority of the benders still need a source. So you need fire nearby, which creates all sorts of wonderful, practical issues. Jordan Hoffman: This is new. 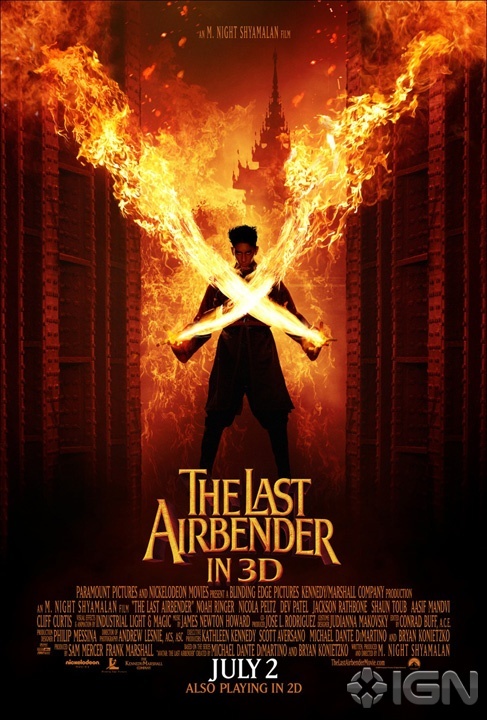 Katara keeps a water bag, but firebenders don’t need that. M. Night Shyamalan: This is totally new. So the Fire Nation will throw in a fireball not only to create damage, but to ensure that there is a source of fire. And Hoffman also addressed the Racebending issue later on in a follow up interview. Jordan Hoffman: One of the complaints is this: you have Inuit actors playing the background of the water bending tribe, yet the two leads, Sokka and Katara, are white, so people looking for conspiracy will point to this. 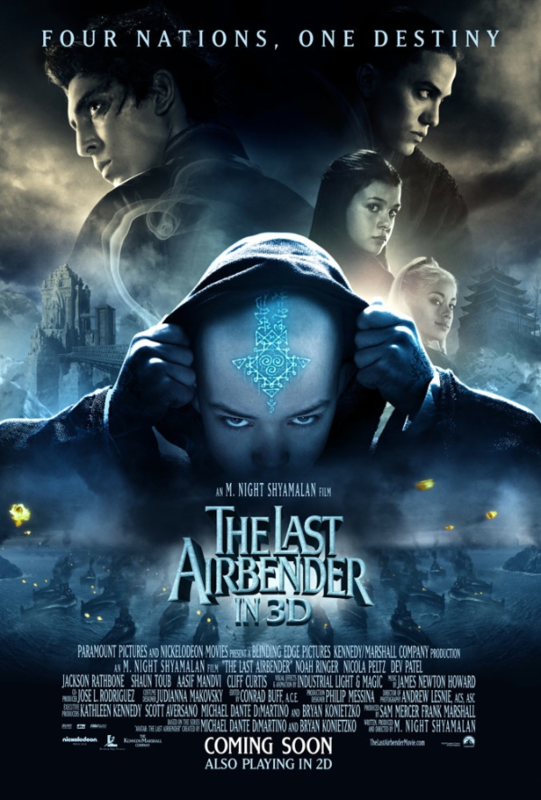 M. Night Shyamalan: When you see the whole movie, where the characters go, the Northern Water Tribe all have the European look that Sokka and Katara have, with a few exceptions here and there. Jordan Hoffman: The other day you said that the second film will feature a lot of the Earth Bending Nation, which is Asian, but there is a community within that that is African-American. M. Night Shyamalan: That’s correct. And I’m pumped for that. Visit UGO.com for the rest of the interview!